David McPhail is awesome and his illustrations have a quiet centeredness to them that really works for this story. I liked the passage of time in the first half of the book but the second half worked less well for me. I'm torn between wanting to introduce concepts such as environmentalism and activism on a child-appropriate level and also wanting to represent the world accurately to children: I am too much a cynic to believe that any road is going to be diverted just because a child says so, and as a result my reaction to this is, "Oh, please." I understand about compressing events and telegraphing narrative arcs. I understand that the suggestion to children that they can have an impact on their lives and surroundings is probably all that is called for here. But where is the middle ground between this particular deliberately naive story and a didactic depiction of dry but effective protests at zoning board and city council meetings? And where did those animals come from? Would it have been more logical and consistent for the story if the descendants of the original settler and their neighbors had rallied to the cause instead of the until-now completely absent gentle animals of the forest? File this one under "Mel Is Too Picky." A man goes to a new land to build a home. He clears the land, but keeps one tree as shade for his home. Several generations grow up in the home and the tree remains. But progress happens. A road is built in front of the home. One day they plan to widen the road to make a highway. The tree must come down. The youngest child of the generations protests. Animals come to help him protest. The builders decide to reroute the road and time goes on.The illustrations are quite lovely watercolor and ink. They are full of color and nice details.The story of the tree watching generations grow up underneath it was wonderful, but McPhail lost me when he decided to twist the story and add a fantasy element to this realistic story. How is it that, because the boy decides to protest the cutting down of the tree, the animals all come to help? This made no sense to me and changed the flavor of the story. I felt I was watching a story unfold about a family. It would have felt more natural to me if the family and the community helped the boy instead.Advertized for ages 4-8 which is about right. This book had great illustrations. It made kids start thinking about family traditions. The tree meant a lot to the great great grandfather, and that carried throughout the generations. I loved the time progression in this one. It was very well done. This is the book that leads me to David Mcphail. The Family Tree is about a man long ago who moves into a new area. He cuts down many trees to build a new house and make a pasture for his cattle. The man however leaves one tree standing that he comes to love. As time goes on he has a family and his boys have a family. Many years later his great-great-grandson is now living on the farm and has also fallen in love with the tree. One day workers come to cut the tree down so that they can build a new road. The little boy protests and soon the road is built around the tree instead of cutting it down. The artistic medias used in the book are colored pencil and water color. I specifically liked how the artist used hatching and crosshatching to make many different shadows throughout the book. Also, the colored pencil allowed the artist to show many emotions by the amount of detail each page had on it. This is a fiction story of a little boy who unites with his animal friends for a good cause. When the tree that has been in his family for generations is going to be cut down, The young boy protests with his animal friends to save the tree. In the end, the young boy and the construction workers create a plan that works for everyone. As a Literacy teacher I would use this text on Earth Day or Arbor Day to show the importance of the environment. The students can also use this text to find out what is important in their own families. The author/illustrator does a very good job in using onomatopoeia and the pictures tell the story perfectly. This story shows the importance of family, traditions, and keeping them alive. The author’s cultural background doesn’t quite relate but he does have a big family and strong family values. This is the story of a very special tree. It was left standing when the rest of the space was cleared to build a house many years ago. This tree would shelter the little house. It witnessed many changes over the years as horse and wagon changed to cars. There were births and deaths on the farm, until finally it was the great-great grandson of the original building of the home who lived there. The tree still stood, strong and straight. But then it was threatened as a new road was planned that would run right through it. The grandson refused to let the tree be cut down, and wild animals join him to keep it from happening. So the road plans must be changed and the tree continues to grow now by the large bend in the road.Read the rest of my review on my blog, Waking Brain Cells. While the previous generations are relevant to the story, they are background information; yet they consume half the pages of the book. We don't actually meet the protagonist until pg 20, and then his story is crammed into the remaining 20 pgs of this picture book. As a result, the story suffers.We do children a disservice to make them think that a small boy and a few forest animals can, without any sort of civil protest and due process, make builders re-route an entire highway. Not that I think municipal bureaucracy needs to be detailed in a picture book, but there isn't even a single mention of government involvement in the entire story. As far as I know, construction workers don't make decisions about where the roads go. The Family Tree is there for it all. It watches as a house is built in its shade and a family is raised and then another. Then the tree is about to be cut down, but the boy who loves it fights to save it. This book, illustrated beautifully in soft pastels and watercolor is a wonderful story. The illustrator does a marvelous job at portraying the time passing and changing the scenery while the tree remains constant. This would be an excellent book to use in a class room to talk about heritage and family trees. Charming story of a man who travels west in the late 1800s to build a house, leave the house and return with a wife, then raise his family there. As he is clearing the land, he leaves one tree standing for shade in the summer and protection from the wind in the winter. generations later, his descendants are sill living in the house and a great great grandchild protects the house from modernization. McPhail's illustrations are full of colorful browns, and greens with a solid white border around each double page spread. These watercolor and ink illustrations are typical of McPhail's style--well done and detailed. The book itself provides a great--albeit overdone--message. It immediately called to mind Gary Crew's and Shaun Tan's The Memorial as well as Virginia Lee Burton's The Little House. Either way, it is worth a read, though it doesn't cover any new ground. This story is about a tree that is planted and how it serves various purposes throughout generations. Eventually, the tree is going to be cut down to widen the road that runs by the house. The little boy who lives in the house, the great-great grandson of the man who planted the tree does what he can to save the tree. Nearby forest animals come to the aid of the boy and the tree is saved to be enjoyed by future generations. If you're going to write a historical fiction picture book, don't end a very straight forward, heart warming story, with a boy surrounded by predators protecting a tree. I was on board with the plot until I saw this illustration. There was no "fantastical" mentions any where else in the book. It is sudden, and seemingly random, to end this way. The art is lovely, and the narrative moves along, but it's rather painful and tortured. We're sad to see the pioneer cut down a forest (portrayed unremoursefully), and then meant to feel happy that one tree was saved? Saved by having a highway skirt it? A very sad tale of "progress," one that left my 5 yr old a bit conflicted. Can't blame her. I really wanted to like this book but I ended up skipping the words of the story and telling my own. It just was too much for my class without actually using a lot of words. I was bored with it and wished that this week when I read it wasn't so chaotic or else I would have read it ahead of time and realized that is was a no go before I started on it. (Mommy's review from 5/12) This is okay but it's hardly worthy of 5 stars IMO. Julia liked it well enough but it's not wordy enough for either of us. We both agreed we really liked the subject, the little boy, what he does, etc. but the story just didn't deliver for us. Shows the history of a tree from the time the land was settled through the years. Finally a young boy must save the tree when a roadway is going to be put where the tree stands. Beautiful illustrations and text that is easy to understand. This book has awesome illustration in it! The way the author uses the pen and ink adding a multiple of lines in this is amazing! It has a good lesson of tradition and starting something new. The colors in this are amazing! I would read this book to younger students. Another beautiful picture book by David McPhail, he never disappoints. I don't think I could do this one for story time because I'm not sure I can get through the part where old generations leave the family and the little boy is standing next to the grave without crying. Beautifully done!!! When I flipped through it I thought for sure my kids and I would be in tears as the boy defends his family tree from a new row expansion. We weren't. It didn't click for us on that level. Maybe it was a bit forced, or for me it was distracting having the word bubbles, and the regular text. In an era of the thoughtless plundering of natural resources, here is a voice in favor of valuing our natural history. This is a nice story to read for Arbor day, or simply to impart environmental values any day of the week. Miss 9 rated this one. Live and let live. The family tree tells a really good story to kids who like to think they can be on there own and what all it takes. I really recommend this book because kids will find it interesting. The story connects children with the environment. I like how it shows that a child with friends' support can make a difference.The illustrations are colorful and it caught my attention. 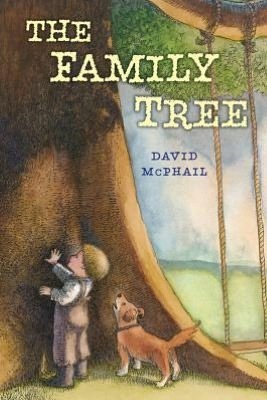 Another nice offering from David McPhail, a gentle story about generations passing and respect for who and what has come before around a story of the importance of saving an old tree.